Data science is a highly interdisciplinary field, incorporating ideas from applied mathematics, statistics, probability, and computer science, as well as many other areas. This book gives an introduction to the mathematical methods that form the foundations of machine learning and data science, presented by leading experts in computer science, statistics, and applied mathematics. Although the chapters can be read independently, they are designed to be read together as they lay out algorithmic, statistical, and numerical approaches in diverse but complementary ways. This book can be used both as a text for advanced undergraduate and beginning graduate courses, and as a survey for researchers interested in understanding how applied mathematics broadly defined is being used in data science. It will appeal to anyone interested in the interdisciplinary foundations of machine learning and data science. Graduate students and researchers interested in applied mathematics of data. What should you expect from a book titled 'The Mathematics of Data'? Nearly anything. 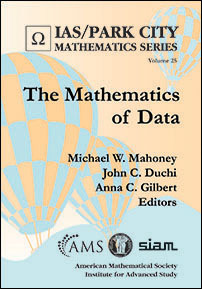 There are numerous elementary books with similar titles that don't go far beyond showing the reader how to compute the standard deviation. But what if you saw that the book was published by AMS and SIAM? That changes everything. You know it won't be elementary, and it will probably be high quality, which is indeed the case here.